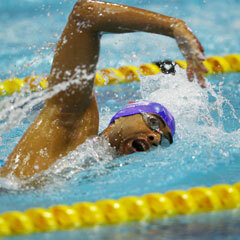 Cape Town - South Africa's Achmat Hassiem and fellow compatriot Kevin Paul have both failed to book spots into the final of the men's 100m freestyle S10 at the 2012 Paralympic Games. Hassiem came last in his heat in a time of 57.61 while Paul clocked a time of 55.55. The final of the men's 100m freestyle will be held later on Thursday at 21:20 (SA time).